Zhengzhou CamelWay Machinery manufacture is one of the large-scale enterprise specializing in construction machinery. 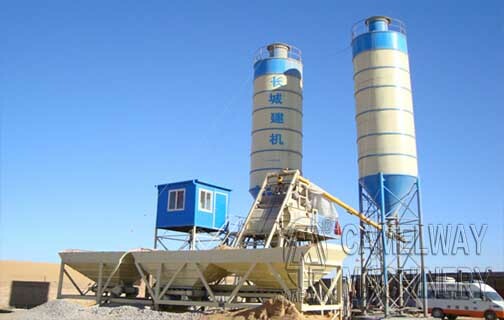 Our company develops and produces concrete mixing equipment which will satisfy your different requirements. Next, we will tell you how to improve the efficiency of concrete batching plant. Equip with 1.2 times number of cement tanker according to the production capacity of concrete batching plant, transport distance, road conditions and other factors. 3.Reserve sufficient capacity of finished product storage. If there is any emergency situation in concrete batching plant, it wouldn’t be stopping working. 4.Sampling inspection of raw materials. Different powders, aggregates and others should be placed separately. Do a good rainproof and dustproof. The storage of aggregates should be 5 times more than daily use. Powder and asphalt should be two times the storage of daily use. If you have any question, you can contact us at any time.